No. 200 in the High Grade Universal Century series! The long awaited HGUC Hyaku-Shiki has been revived! Piloted by Quatro Vageena in Mobile Suit Z Gundam Hyaku-Shiki has been revived for the HGUC series. 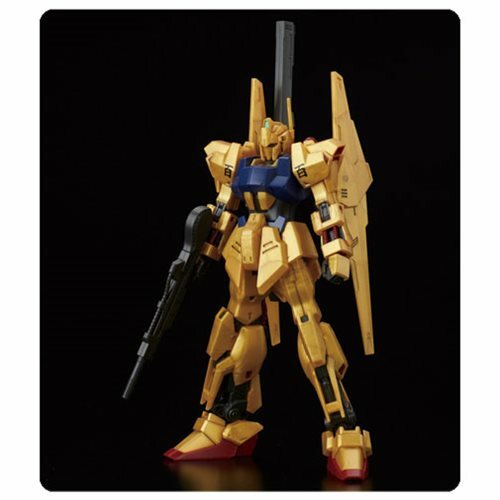 The Mobil Suit's characteristic gold color from the anime has been reproduced using metallic colored plastic. With optimally balanced proportions and the latest range of movement, the model can be displayed in a variety of exquisite poses. Different camera eye settings can selected using different eye stickers. Set includes a beam rifle, clay bazooka, and two beam sabers. Comes with 10 Runners, 2 Marking stickers, and Instruction manual. Measures approximately 5-inches tall when complete. Ages 15 and up.